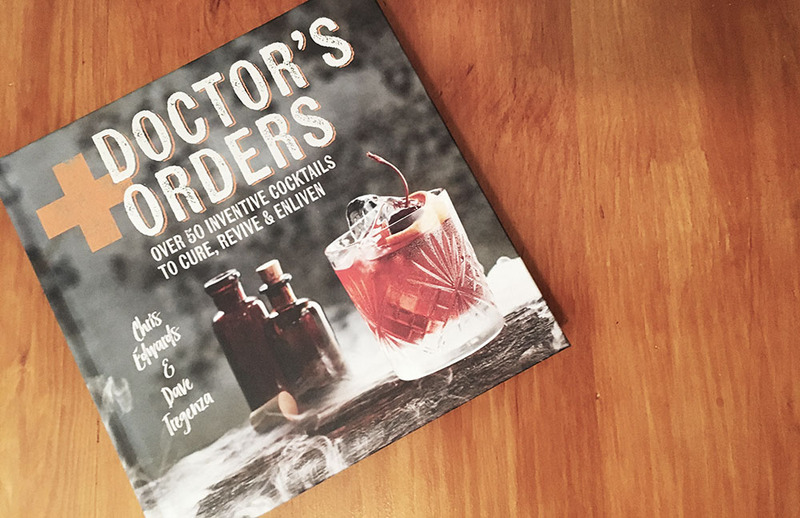 From the minds behind London bars, The Shrub & Shutter and The First Aid Box, comes the inventive, entertaining and palate-pleasing cocktail book, Doctor’s Orders. Chris Edwards and Dave Tregen created healthy cocktail recipes called “Doctor’s Orders” cocktails to serve at both their bars, and this inspired them to prepare a guide that allows cocktail lovers to walk the line between boozy and healthy without sacrificing flavour and taste. Doctor’s Orders is split into two major sections: Set Up and Recipes. Set up is a guide to stocking a home bar, making shrubs, tinctures and syrups, and ensuring you have the right tools to make whatever drink tickles your fancy. Recipes is, well, recipes. They’ve included Remedies, Comforters and Revivers. Each recipe includes health benefits (ie, why the doctor might order you to drink it); vitamins and minerals found in the glass; style and tasting notes; recommended brands for the best mix; the recipe itself; and swaps/alternatives to ingredients. Overall, the recipes are easy to read, with well labelled steps and page references for the most time-intensive parts. Most of them even have a guideline on when to start preparing the recipe (that day, day before, etc). I tested out their Dr. Seuss cocktail (recipe below) and it was delicious. Like fresh pressed juice balanced with lime tartness. I plan on making a pitcher, sans alcohol, and keeping it in my fridge as a refreshing summer drink. Overall, this is an excellent addition to any cocktail lover’s library. It would be especially valuable to anyone who is on a health kick, but still wants to imbibe every once and a while (or every night, I don’t judge). Step 1: Peel and slice 2 kiwis and add to a jar filled with a 700 ml (28 oz) bottle of gin. Leave to infuse for at least 2 days. Step 2: Add 1 kilo of strawberries, 1 bunch of fresh thyme and 100 ml of mineral water to a saucepan over a medium heat. Bring to a boil and then reduce to a low heat and simmer until all the fruit has broken down to a pulp. Let cool before straining the mix through a sieve. Step 3: Add 6 kaffir lime leaves to 500 ml (18 oz) of hot sugar syrup. Leave to cool then strain. Add all the ingredients expect the tonic water to a shaker, shake hard and single strain into a glass filled with ice and 4 slices of fresh kiwi. Top with the cucumber and watermelon tonic water and more ice if needed. Ensure all the fresh kiwi slices are spread around the glass by churning with a bar spoon.